I have said for years that "children are a product of their environment". If you see a child that misbehaves, more than likely they were allowed or even taught to act this way. If you see a child that is rude or disrespectful, they could be modeling what they have seen from others. If you see a child that plays quietly and listens during church, more than likely this behavior was encouraged. If you see a child that is well mannered or gets along most of the time with their siblings, they have probably been treated with respect themselves. I know that there is an exception to everything. 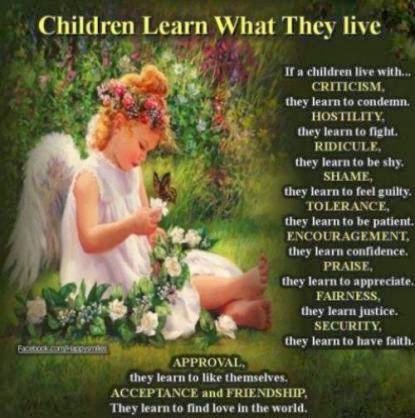 I know that not all children who are considered "good" come from ideal environments. I know that not all children who mimic unfavorable behavior, had parents who didn't care. For the most part though, we are who we are because of the circumstances that encircled us & molded us. Just like the saying "you are what you eat. ", children become what they see. This is an especially hard pill to swallow right now since I am raising a preteen boy who knows everything & wants to argue with the wall. This is especially hard when I see him lash out in anger & disrespect. This is especially hard when I see my 8 year old daughter purposely pick fights with her brother. This is especially hard when I see her leave her room in a state that could easily be classified as a disaster zone containing HazMat materials. I keep looking at my children, wondering WHAT happened to cause these behaviors. It doesn't matter that the majority of all children go through these stages. It doesn't matter that we went through them growing up. It always looks & feels so much worse when it happens in your own backyard though. Then I realize that although a lot of these behaviors are a natural part of growing up and a lot of them can be attributed to man's natural tendency to sin, that many of them can be traced back to me. Yes, children are the product of their environment. Even when that environment isn't ideal. As I watch my children & try to correct their behavior, I pray that God help me change my sinful nature as well. I pray for mercy & grace as I try to remember to act with mercy & grace instead of justice. I pray that one day, my children grow up to be a better Christian example than I have provided for them.